Pick up True Hemp Pet Supplements at Noah’s Pet & Wild Bird in Fayetteville, Arkansas. True Hemp™ is a hemp-based pet product designed specifically designed for our canine companions. Hemp-based pet products come in a variety of formulas including dog chews, dental sticks, and supplement oils. Take a look at the True Hemp products we have in-stock at Noah’s Pet in Fayetteville. 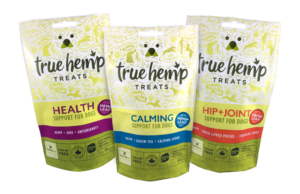 True Hemp Calming – It is difficult to see our dogs in anxious or stressful situations. This unique True Calm® formulation combines hemp seed with active ingredients; creating a synergistic effect that promotes the reduction of hyperactivity and helps bring calm to their day. True Hemp Hip & Joint – It is difficult watching our dogs age and slow down. This unique True Spirit® formulation combines hemp seed with active ingredients; creating a synergistic effect that supports joint function and the body’s normal response to inflammation. True Hemp Immune & Heart – It’s important for our dogs to have a strong heart and healthy immune system. This unique True Love® formulation combines hemp seed with active ingredients; creating a synergistic effect to help keep dogs of all ages in peak condition. Stop by Noah’s Pet & Wild Bird in Fayetteville for all your pet supplies. We’re conveniently located at 2000 N Crossover Rd # 3, Fayetteville, AR 72703. This entry was posted on Monday, October 8th, 2018 at 7:22 pm	and is filed under News & Updates. You can follow any responses to this entry through the RSS 2.0 feed. Both comments and pings are currently closed.